Kwajalein Island is the largest and southernmost island in the island chain of Kwajalein Atoll, Republic of the Marshall Islands (RMI). Although it is the largest island of the atoll, it is a mere 3 square miles in size. It is commonly referred to by local residents as “Kwaj”. 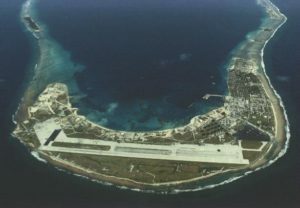 Kwajalein is leased to the United States government by the RMI and is a fully functional Army base. The central Pacific location is ideal for strategic defense operations. The population of Kwajalein is made up of U.S. government contractors, U.S. government civil service and U.S. Army personnel. Indigenous Marshallese do not live on the island, but are ferried daily to and from the nearby island of Ebeye and they perform non-mission jobs. Marshallese maid service is particularly enjoyed by the residents of Kwaj. There is even a K-12 education program in place for a limited number of Marshallese students to learn from the top-notch school system on-island. USAG-KA’s main mission is to support the Ronald Reagan Ballistic Missile Test Site (Reagan Test Site/RTS), which uses radar, optics and telemetry for space surveillance/object detection and ICBM/anti-ICBM missile testing. One of the newer projects, currently under construction, is Space Fence, which will be capable of tracking near-Earth-orbit satellites and space debris as small as 30 inches. Kwajalein, like the rest of the Marshall Islands, has a typical tropical marine climate. The trade winds dictate the weather trends. The island gets about 100 inches of rain per year, with May through December being the wettest months. During the latter, it is not unusual for the forecast to read “long periods of continuous heavy rain”. It is persistently breezy, which is a good thing for many reasons, with higher winds being December through April (~17 mph) and calmer periods being May through November (~12 mph). Surprisingly, the water is extremely smooth in the natural lagoon, even with a 12 mph wind, and affords the best water sports at mid-tide. Temperatures average around 87 degree highs and 78 degree lows. Humidity amplifies the “feels like” temps, so the effect is what one would expect on a tiny island (~1.2 sq. mi.) which is just barely north of the Equator (~600 miles). Tropical storms and typhoons are few and far between (5+ years apart) and typically just barely skirt the RMI due to its far-east location in the Western Pacific storm formation zone. Stronger storms usually get winds not stronger than 50 mph. El Nino and La Nina significantly impact the weather outcomes. Climate change is a huge issue with the Marshallese, as there is a trend of higher than average King Tides in recent years which have inundated homes, businesses, farmland and cemeteries on many of the atolls.